That's all from us. Here's a reminder of when we are back in SheBelieves Cup action. 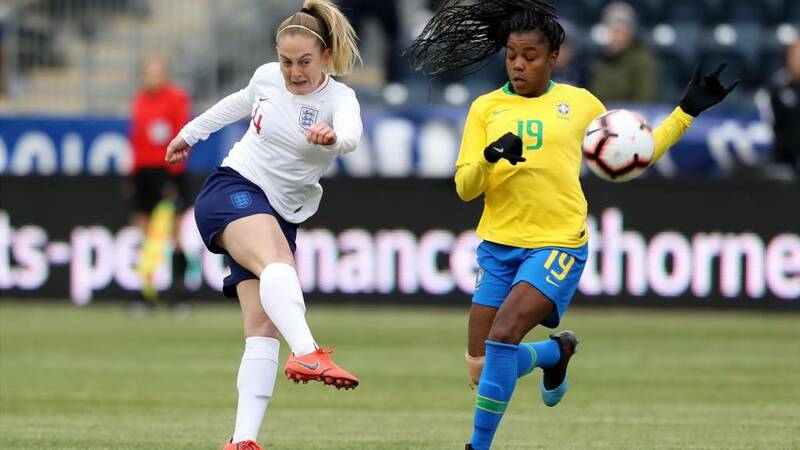 England have their first win under their belt after beating Brazil...and it's the World Cup holders up next! Scotland's women take centre stage on Friday at the Algarve Cup. Scotland, who are grouped with England at the World Cup, are making their first appearance in the Portugal tournament since 2002, with seven of the 12 competing nations having qualified for France 2019. You can watch live coverage of Friday's match against Canada on the BBC Sport website at 13:15 GMT. England manager Phil Neville said: "It was a really tough game because of what had happened in the previous three or four days. I had a lot of tired players but the determination in the second half was as good as I've seen as manager. On Brazil's goal: "I thought it wasn't a penalty. There will be VAR at the World Cup so decisions like that will be better. But at half time, that was the least of my worries, and I was probably a bit harsh on them because my frustration and anger boiled over." Individual players making a statement to Phil Neville is the most important thing at this tournament. Making a statement to other teams is less important. Beth Mead has been having a fantastic season for Arsenal. She is full of confidence getting into those areas and it was definitely a shot. That's what you want with subs coming off the bench making an impact. That was probably England's least threatening of the three fixtures in the competition, and they'll gain confidence after that second half performance. Next up? Reigning world champions USA. I think the victory is deserved. They looked leggy in the first half but they were completely different after the break and they played with much more intensity. England win their opening SheBelieves Cup game. Two minutes added on. England seem in control. They've just got to see it out now. Want to rate the players? Well, you can! Head here for the England v Brazil player rater. I think that was a perfect tackle and Beth Mead has done so well since she has come on. She's scored the goal but her work rate off the ball has been impressive. There's increasing frustration with the officials from the England players. Beth Mead (she's everywhere!) makes a perfectly-timed tackle on Andressa but the referee ain't having it. She's penalised. Mead throws her arms up and down in frustration. England have a corner. Beth Mead's slightly mis-fired attempt evades a stooping Fran Kirby. The Lionesses maintain their forward pressure and earn another corner. Alex Greenwood has a go this time and it's straight into the keeper's hands. You wonder if that goal by Beth Mead has just upset the goalkeeper? That was poor and she takes her eyes off the ball but she recovers well. Aline spills the ball. Right in the path of Nikita Parris! The Man City midfielder - waiting in the box - controls it and fires towards goal but the Brazil keeper recovers to palm away. She completely caught the goalkeeper off guard. She was lined up for the cross and I'm not sure she was aiming at goal but it was a fantastic finish. I might be doing her a disservice but it's brilliant and England deserve it. Woah! Pick that one out! Beth Mead, wide out on the right, bends a curling ball into the top corner. Did the Arsenal forward mean it? Was it a cross? Was it a shot? Who cares! It caught the keeper off guard and it was a beauty.